By adding a generator to our Electric Load Assist, Cool Technologies’ Ultimate Work Truck (UWT) provides up to 300 kVA of mobile electric power. The generator can power a welder, compressor or bucket truck arm. And in the event of an outage or disaster, businesses can dispatch auxiliary power when and where it’s needed to keep facilities open and minimize losses. Plus, they still accrue all the ancillary benefits of a hybrid conversion. Any truck (Class 3-8) can become an Ultimate Work Truck. The conversion doesn’t invalidate truck warranties nor require government approval or certification. With an Ultimate Work Truck, companies can avoid the cost of purchasing and towing mobile generators or purchasing auxiliary generators period. A 50 kW mobile generator set mounted on a skid usually costs around $36,000. Converting existing vehicles into Ultimate Work Trucks will deliver an automatic savings of at least $10,000. The UWT addresses the anti-idle laws in jurisdictions across the country as well as the Environmental Protection Agency (EPA) view that vehicle idling is harmful. 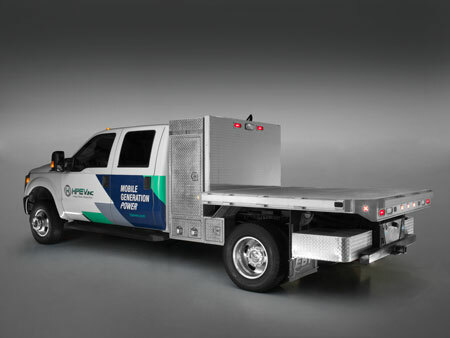 Because the UWT incorporates a battery storage system, vehicles generate power without idling. Cool Technologies also offers a Mobile Auxiliary Power system as a stand-alone without Electric Load Assist.